Marine environments are hard on structures. If the structure is near salt water, the salt corrodes and degrades it. Even fresh water can corrode metal and cause damage due to humidity. Of course, then there is the wildlife — sharks like to bite everything to see what it is, marine mammals do the same, and they use the structure in even less appealing ways at times. What can withstand all this abuse? Stromberg GFRC can, and does, withstand not only these assaults on it but hurricanes and other natural disasters. 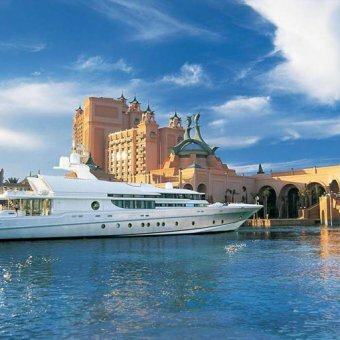 Witness the structures at the Atlantis Resort in the Bahamas. Along with stone ply, GFRP, Coral Stone, and Coquina stone, GFRC was used to provide the sculptures at the park, underwater faux ruins, items in the shark tanks, and many other parts of the structure. These structures survived several hurricanes, one a category 5, with no damage. Because the concrete is reinforced with glass fibers instead of metal, it will not rust and can be used in a saltwater environment. It is light enough to be used in pontoons, but heavy enough to withstand a lot of use. Stromberg GFRC can also be used to construct fountains. Cast figures and designs can be included when the GFRC is made. Stromberg GFRC is strong enough to stand up to the continuous flow of water through the sculptured fountain and to hold the reservoir of water safely where it is wanted. No leaks here! If you have a marine project, consider using Stromberg GFRC to build it. We will work with you to produce your vision. For more information and assistance with your design challenge, please call us at (903) 454-0904 today or email us at info@strombergarchitectural.com.